6.92 points at 13 votes (rank 366). You are a treasure hunter of the new generation. Equipped with protective suit, laser, bombs and a pod you enter the depth of the earth to find hidden treasures. On the way you need to beware of traps, animals, swamp pits and other deadly dangers. With your laser you can shoot your way free and with the bombs you can blow up walls. In some rooms additional bombs and energy supply can be found. When you have reached the treasure chamber you only have to deactivate a self-desctruction mechanism. For this you need to fill out a marked field with puzzle stones bevor the match cord of the bomb has burnt. If the classics H.E.R.O. and Tetris come to your mind, your are completely right! 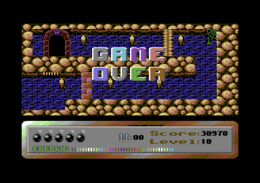 Multi-coloured 2D-graphics, single screens, which are switched when crossing the border of the screen. Simple sound effects. 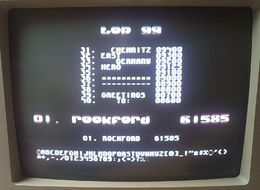 The game is controlled by joystick in port 2. Every 10.000 points you get an extra life. The version by "Fatum" offers the following trainers: unlimited lives, unlimited bombs, unlimited tries, unlimited energy, directly to part 2. Tolotos: "It is a rather accurate conversion of H.E.R.O. with a bit better graphics. The game is a bit harder, as there are often rather mean "Energy Walls" on the way. Atmospherically, I like H.E.R.O. better.". Rockford: "I find it very positive that they tried to preserve the feeling of H.E.R.O, and that with good results. Only the manoeuvring in the air seem to me a bit too notchy, but this can also stem from my inability. They have expanded the palette of monsters by interesting enemies and also improved the traps. I liked the "Get Ready!" music from the first second. What I cannot cotton up to are the colours. One can be glad, that there were only 16 to choose from... if there had been 32, they probably would have tried to stuff all of them in somewhere. A big great "Urgh!" for this. What also stroke me as negative, is the great probability to die directly when entering a new room, which keeps me from giving a higher vote. All in all it is a useful alternative, when you are fed up with the 20 levels of H.E.R.O. 6 points." Robotron2084: "As Rocky already mentioned is the choice of colours really sickness arousing, the controls spongy and there are too many possibilities to die through no fault of one's own. 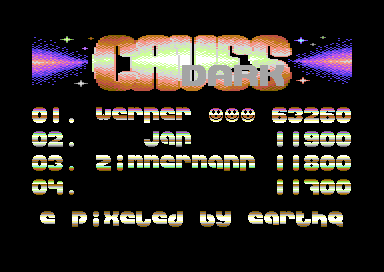 That I cannot approve, the more so as one tried rather boldly to clone one of THE C64 classics here. 4 out of 10 points, I won't play this game again so quickly." 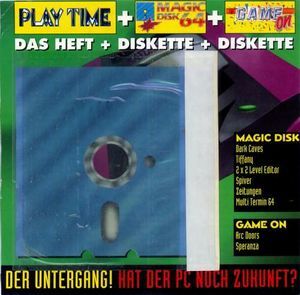 The highscore list has 99 entries and is saved on disk. This page was last modified on 26 February 2019, at 20:02.